Solar Panel Charge Controller - First Mate Marine Inc.
​The Tracer BN series is EP Solar’s second generation of MPPT controller. 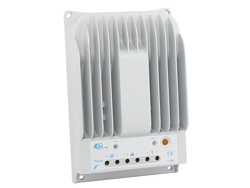 It has rapid MPP (Maximum Power Point) calculation capability to achieve the maximum output of a solar array. At 99.5% efficiency it is one of the most energy efficient controllers available which means it will convert the maximum amount of solar energy to battery charging power. It also has extensive communication ability. You can monitor your solar panel performance through your laptop computer or through the MT50 remote display. The die-cast aluminum design ensures excellent heat dispersion. 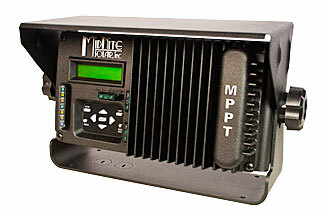 Compared to conventional PWM controllers, MPPT technology may increase the charge efficiency up to 30% and potentially decrease the power of the solar array needed. 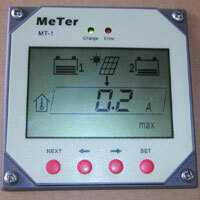 ​The Tracer BN package includes the MT50 remote display. 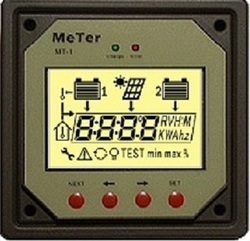 The Tracer BN can be programmed from the MT50 remote display or from a computer connected via special cable. ◆ Support 4 charging options: Sealed, Gel, Flooded and User. ◆ Battery temperature compensation function. ◆ Real-time energy statistics function. The MT50 Remote Display is used to monitor the performance of the solar panels including volts, amps, watts and cumulative watts. It also displays the state of charge of the battery bank and the controller status. It is used to easily program the operating parameters of the Tracer BN controller. The display includes a 10 foot (3 meter) cable with RJ45 connectors that simply plug into the controller and the display. This display is included with all of our Tracer BN Controllers. The optional remote temperature sensor constantly measures and displays storage battery temperature so the controller can adjust charge rate appropriately. This is especially important when using temperature sensitive gel batteries. This option could increase battery life by 100-200 charge/discharge cycles. The sensor plugs into the Tracer BN Controller and is attached to the top of a battery in the battery bank with tape or adhesive. 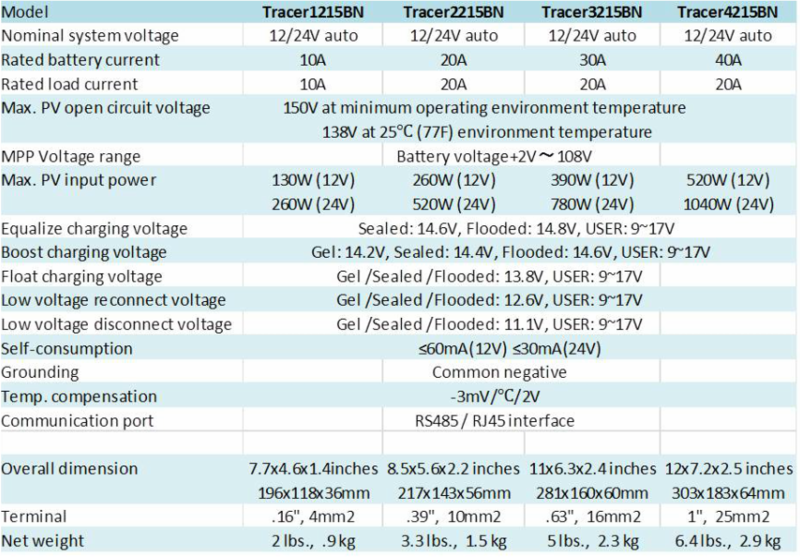 The Tracer BN series has rapid MPP (Maximum Power Point) calculation capability to achieve the maximum output of a solar array. It also has extensive communication ability. The die-cast aluminum design ensures excellent heat dispersion. 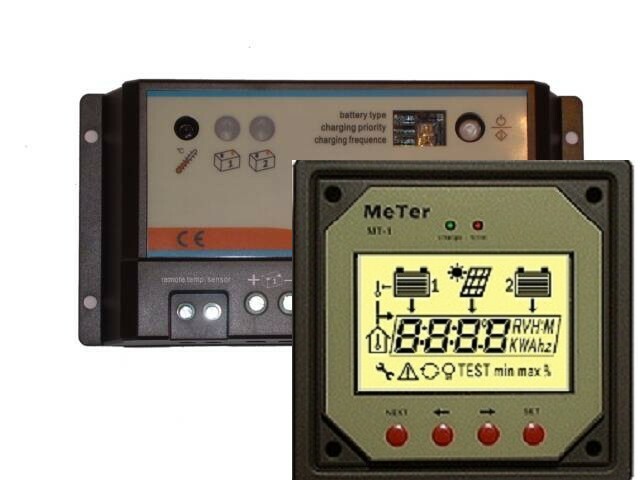 ​The Tracer BN package includes the MT50 external display. The Tracer BN can be programmed from the MT50 external display or from a PC computer connected via cable. This temperature sensor includes a 6 foot (2 meter) cable. It plugs into the Tracer BN controller and is attached to a battery in the battery bank. The Marine version of The Kid comes with the mounting bracket, 4 ft of flex conduit, battery temperature sensor, and an extra conformal coating. 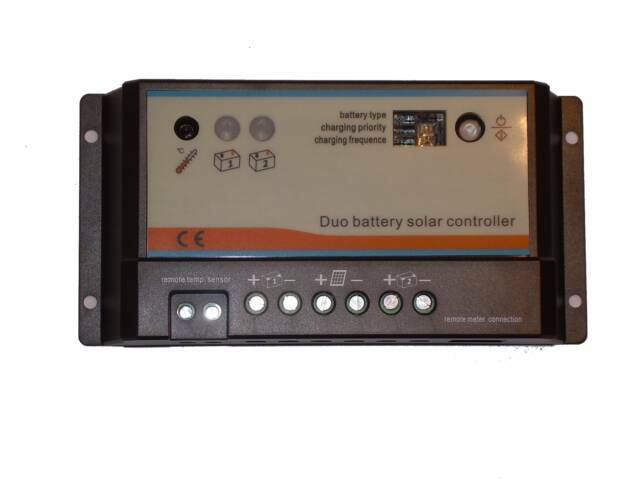 The marine version of the MidNite Solar Kid charge controller is available in both black and white versions. Please choose your color from the drop down menu above when ordering. The Kid is MidNite Solar's newest charge controller. 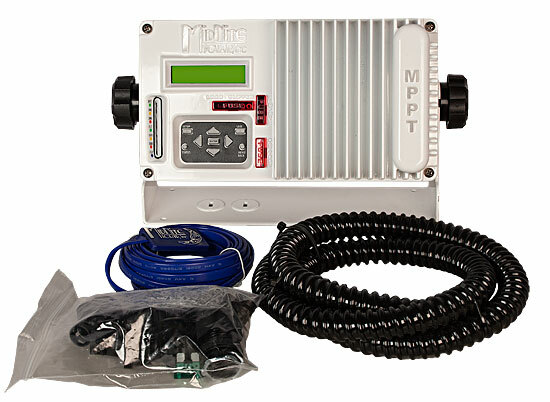 It uses MPPT technology to minimize power loss from your solar panels. The unit is capable of charging battery banks at 12VDC, 24VDC, 36VDC and 48VDC. The Kid is designed to work with solar panels and will also work with wind and hydro systems once the firmware update is released in second quarter of 2014. It also has the ability to give amperage readings with the optional Whiz Bang Jr and a 50mv/500A shunt. Specifications: Voltage range for batteries: 12 to 48 volts DC Voltage range for solar/wind/hydro: Up to 150 volts DC input Up to 30 amps output Can be connected in parallel for a total of two Kid controllers. Built in lighting controller: dusk-dawn, hourly, day and night settings Reverse polarity protection Sealed for harsh environments No cooling fan Dimensions: 9.5"L x 6.6"W x 3.4"D Weight: 7 lbs. NOTE: Currently MidNite is shipping the KID without the AGS feature. To receive the AGS feature with your KID, request an AGS model when ordering. There is no extra cost for AGS. 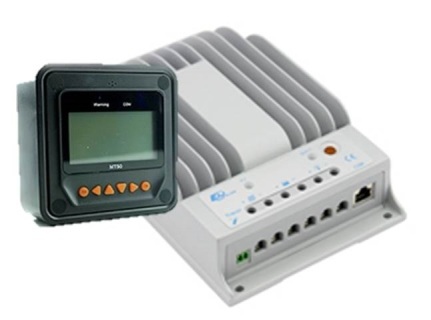 The Marine KID is the most versatile medium sized charge controller on the market. Ideal for small renewable energy systems. Available in black or white. The Marine version comes standard with the mounting bracket, 4ft of Flexible conduit and Battery temp sensor. The sensor plugs into the Dual Bank Battery Controller and is attached to the top of a battery in the battery bank. The proper wire from the panel to the controller and batteries is important to minimize voltage drop and thus obtain maximum performance from your solar panel. Our wire is made for the marine environment and will provide optimal power throughput with minimal voltage drop. Our solar panels are factory wired with pigtails and MC4 connectors. 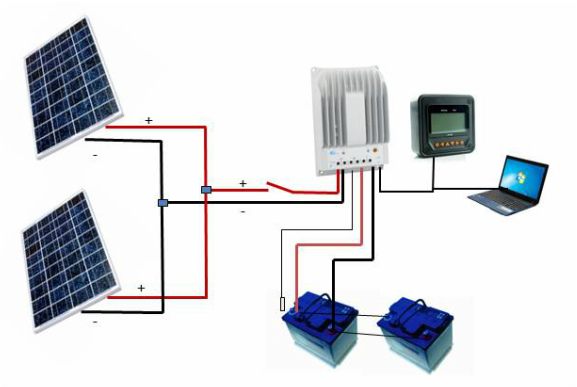 Thus, you will need a pair of connectors to connect the wire to the solar panel. We will pre-install the connectors to the wire ordered so no tools will be required. 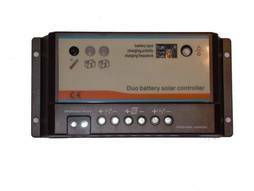 This is an excellent controller for all of our CMP marine solar panels. One male and one female connector pre-installed on the wire ordered.